differences. Students will do some journal writing as they listen to Sign of the Beaver book chapters. A keyword will be provided to help them get started and give them a focus. Journals: Make a journal with a construction paper front to decorate and notebook paper inside. The alternative would be to have the students bring in a new spiral notebook or composition book. There are twenty-five chapters in this book, each about five pages long. In each chapter an event shaped Matt’s feelings and enhanced his learning, as he tried to survive alone in the forest. Write a journal entry as if you are Matt, the main character. For each chapter a keyword is given. It is meant as a guide to help you get started. Describe each experience and perhaps how it changed Matt in some way. A summary sentence is given for you beneath the keyword for each chapter. It will help you, as you are writing your journal. Before you begin to read each chapter, write the keyword(s) downs so you will know what to listen for in the chapter. For example, before you begin to read Chapter 1, write “Counting Days”. Matt and his father built a small cabin on their newly purchased land in Maine. Father left Matt at the cabin to guard it and tend the crops while he went back to get Mother, sister and new baby in Massachusetts. Without a calendar, his father told Matt to make a notch every day on a stick. Seven notches per stick on seven sticks and then Matt’s family should return to the cabin. Matt was beginning to enjoy being along to do his chores without parental advice. He had to chink the spaces between the logs with clay from the creek bank. He also tended the crops, chopped wood, killed something for dinner and cooked. A bold stranger comes to visit. He eats lots of food and while Matt is sleeping the stranger steals Matt’s rifle. What will Matt use to get his dinner and for protection? Matt forgets to bar the door securely and a bear gets into the cabin, wasting food and making a mess. Hungry for something sweet, Matt climbs up a tree and breaks into a beehive. Angry stinging bees chase him to the creek. Swollen and poisoned by the stings he is carried back to his cabin and cared for by two Indians. Old grandfather Indian makes “treaty" with Matt. Matt will teach the Indian’s grandson, Attean, how to read in exchange for food from the Indians. How would Matt teach Attean how to read? He’ll start with the ABC’s; apple, bone, candle, door and so forth. Matt grabs Attean’s attention by reading Robinson Crusoe. Attean compares the white man’s way of doing things to the Indian’s way. Chapter 9: “Not be slave"
Matt asks Attean to show him how to trap a rabbit. Then, when reading Robinson Crusoe, Attean becomes upset when he hears that the native becomes a slave to Crusoe. Matt smooths over the idea that the native was a slave to Crusoe and seems to calm Attean. Attean takes Matt fishing the Indian way. Attean leads Matt into a new part of the forest and shows him a beaver dam. He points to a marking on a tree—the sign of the beaver. Attean is part of the Beaver tribe. The Indian teaches Matt how to make his way in the forest so he would not get lost. Attean shows Matt how to make a bow and arrow. Matt learns more about Indian ways when they find a fox in an iron trap of the white man. Attean shows signs of learning from Matt, too, when he says, “Reckon so and by golly." When Matt finished reading Robinson Crusoe, he reads adventurous stories from the Bible. Noah’s Ark is the first story and Attean knows a similar Indian story. The boys come face to face with a bear and together killed it. Attean takes Matt to his village to celebrate killing the bear. Matt enjoys food, dance and storytelling. He sleeps there in a wigwam. Matt learns that Attean’s grandmother hates all white people, so Matt is not welcome in the village. Matt wonders why his family has not come to the cabin. It has been ten weeks since Father left. He wanders in the woods and finds Attean’s dog caught in a white man’s trap. Unable to open the trap, Matt races to the Indian village and summons Attean’s sister to help him rescue the dog. Attean’s grandmother welcomes Matt back to the Indian village. The boys play rough Indian games. Matt finds his way back to the cabin using what he learned from Attean. Attean goes on a ritual journey to find his “Manitou" (spirit). It is a passing from youth to adult. The Indians will be moving on from the village to hunt for moose. They invite Matt to come with them because they don’t want him to be alone. Matt refuses, though he is honored, and wants to wait for his family. The boys say good-bye. Attean leaves his dog with Matt and Matt gives Attean his father’s watch. Matt does many chores to pass the time. It is work that Attean would call “squaw’s work". Matt keeps hoping that his family will arrive. Deep snow surrounds the cabin and Matt tries out the snowshoes that the Indians gave him. He feels safe and content in the cozy cabin. Matt’s family arrives just before Christmas. Sickened by typhus, the journey had been delayed but mother insisted on getting there before the holiday. The baby died shortly after being born. Father was proud of all that Matt had accomplished. 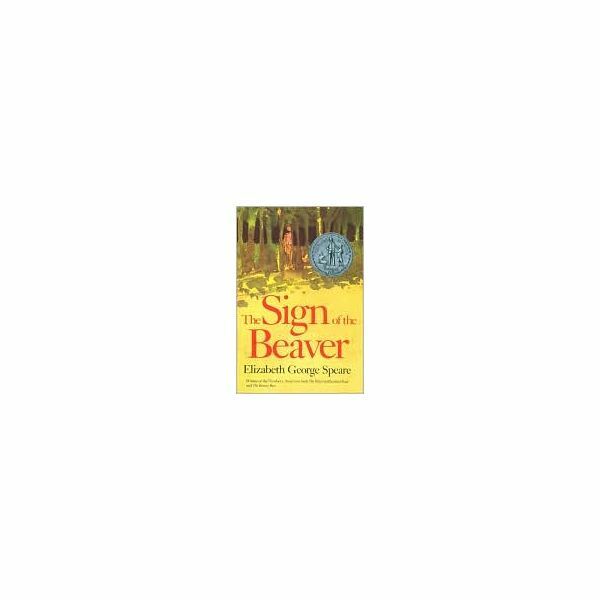 As you listen and write about each of The Sign of the Beaver book chapters, you will begin to understand the difficult life of the pioneers. The book also provides an insight into how the Indians felt when the pioneers began to push them off of their land. Journal writing will provide you with a vehicle to express the main characters fears, frustration and triumphs. Speare, Elizabeth George. The Sign of the Beaver. Dell Publishing, 1993.